Another one I’d never seen before, Brokeback Mountain has a reputation to live up to, but of what I didn’t really know. 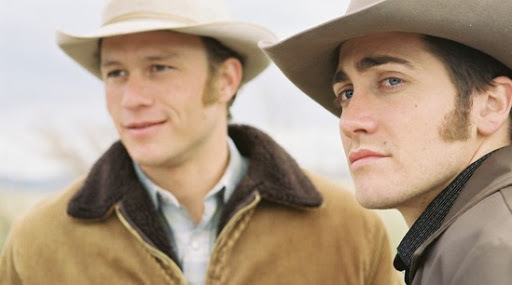 Yes, I was aware it was about two cowboys, Heath Ledger and Jake Gyllenhall, and that between these two, something happened in a tent, involving at least one of their man-parts and the other’s posterior, but as to how this would support a feature length picture I did not know. Wisely, director Ang Lee gets past the, ahem, climax early on, spending a greater deal of time depicting the aftermath of the relationship Ledger’s ranch hand Ennis Del Mar and Gyllenhall’s rodeo cowboy Jack Twist form on the time they spend herding goats together. Ledger easily surpasses Gyllenhall on the acting front, mumbling his way through the difficulties that come with having an affair, and Michelle Williams also impresses as his put-upon spouse, realising the truth about her husband yet living in acceptance and despair. The slow pace of the film allowed for some great character interactions too, and I approved of the film only featuring important sections from the central relationship and nothing else, with what some would describe as pivotal events – Twist’s marriage to rodeo girl Anne Hathaway or the birth of Del Mar’s two children – being skipped entirely, as to the main couple these were of secondary importance to the connection the two had with each other. This entry was posted in 07/10, 1001, 5-Star 500, Choose Film, Empire Top 301, Empire Top 500, Review, TF 100, The List and tagged Ang Lee, Anne Hathaway, Brokeback Mountain, Heath Ledger, Jake Gyllenhall, Michelle Williams, Randy Quaid by jaycluitt. Bookmark the permalink.